This is a rare opportunity to have a very large boat, that is ready to remodel. Has been in freshwater since 2008. 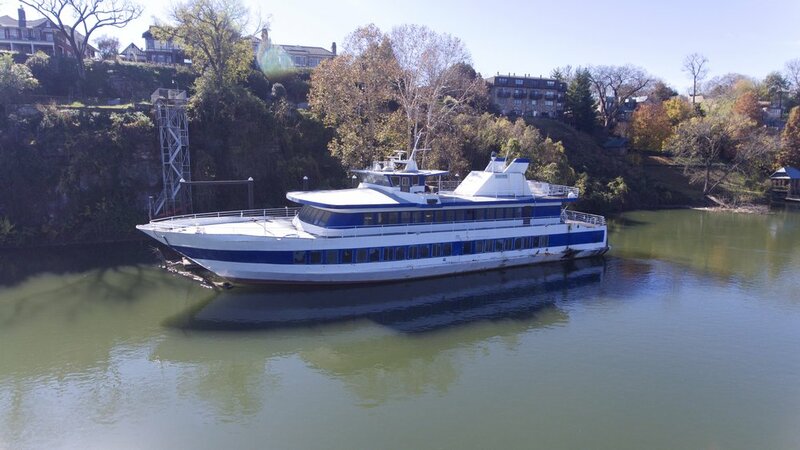 She was originally setup for gambling trips and most recently was being remodeled for restaurant service. The project lapsed and the owner is ready to sell. Her Certificate of Inspection has expired. The main propulsion engines are twin Detroit Diesel Series l2V 71, twelve (12) cylinder, each rated 280 BHP @ 1200 RPM. The engines are electric start and are fitted with alternator, heat exchanger, raw water pump, and belt driven hydraulic steering pump. The port engine is a model 7127­7040 and the starboard engine is a model 7123­7001 with serial number 12V A28889. Port serial number was not visible or was obstructed. The engines turn the propellers through Twin Disc a model SP214PI reverse/reduction gears with pneumatic clutches, port serial number 1 U8556 and starboard 127609, and Jastran model RP04 Z­drives, port serial number 268 and starboard 265. The electrical power is provided by two (2) Detroit Diesel Series 6­71, six (6) cylinder engines, which drive International Electric Corp. 170 KW AC generators. The engines are electric start and are fitted with alternator, heat exchanger, oil cooler, and turbocharger. The engines are model 1063­7305 with port serial number 6A0438388 and starboard 6A0438389. The electric power to the gaming machine circuits and bow thruster is provided by a Cummins diesel, six (six) cylinders; model T335GC, serial number 749129, which drives a 175 KW generator. The engine is electric start and fitted with a tube heat exchanger and turbocharger.